The DefineDynamicModule has an overload which lets you specify whether symbol information should be emitted, and by default it's false. 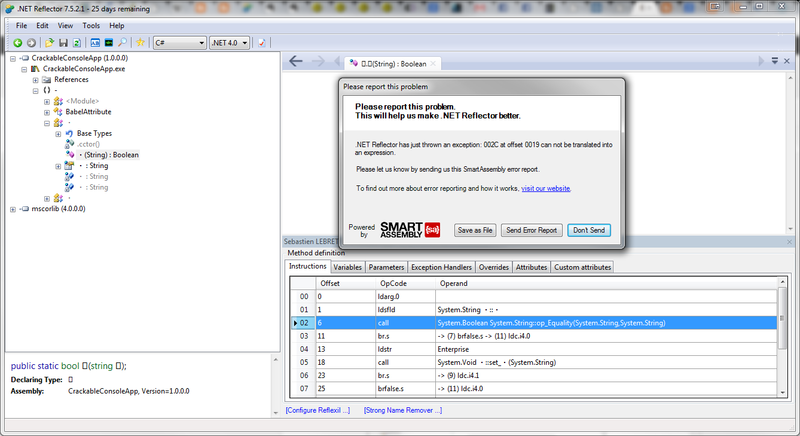 By setting this emitSymbolInfo argument to true, it will also emit the pdb file for your assembly. For this tutorial, I will be making use of Reflector and a plugin for Reflector called Reflexil, and also Gray.Wolf to partially view unobfuscated C# code. 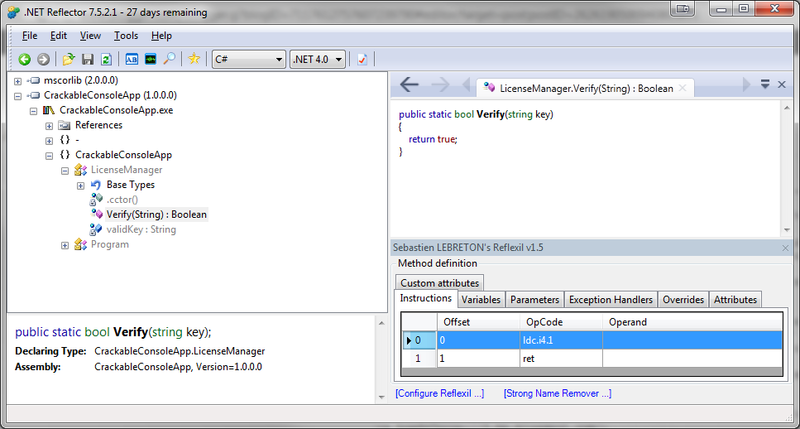 From the code, it's fairly easy to see that to bypass the license key validation logic in our application, we simply need to modify the LicenseManager.Verify method to just return true rather than check for the valid license key. Now there are couple of ways we can modify the code with Reflexil...but let's start with the harder way, by modifying the CIL code directly. 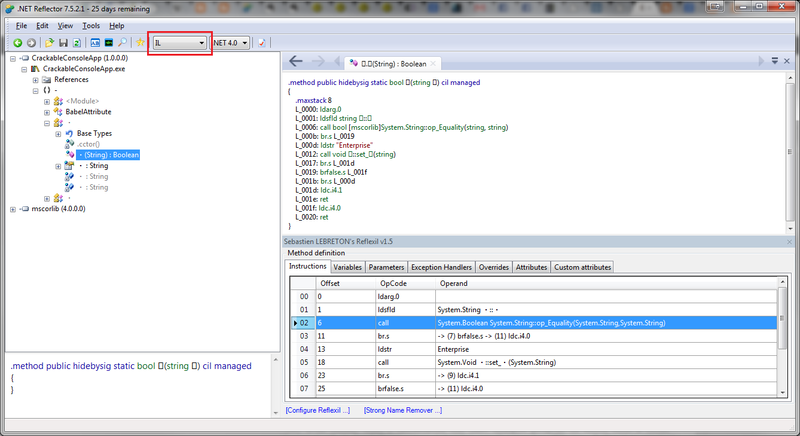 ldarg.0 loads and pushes the actual argument at position 0 (string key) to the stack. 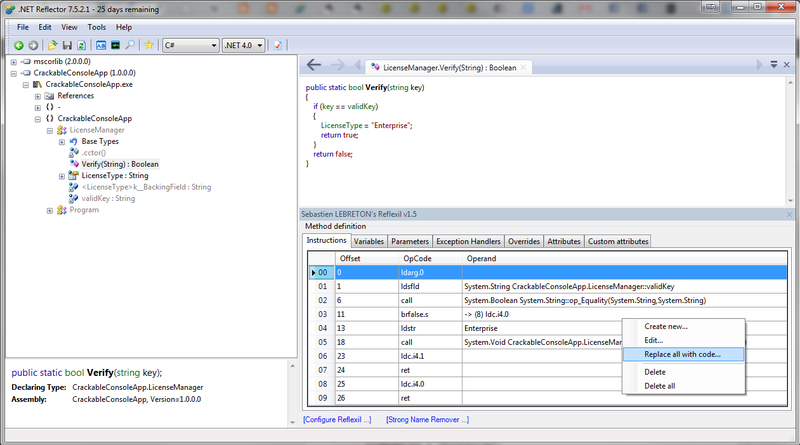 ldsfld loads and pushes the value of the static field validKey ("112358") to the stack. call invokes the System.String::op_Equality(string, string) method by popping the last two values from the stack, comparing them and then popping the returned boolean value on the stack. ret pops and returns the value that the op_Equality last pushed on the stack. Now that we know what's going on, we need to change these instructions to simply return true rather than comparing the strings. ldc.i4.1 to push the constant value of 1 onto the stack. ret to pop and return that value. As for why you see a .maxstack in the above examples, you can find a pretty good explanation here. It seems that this is used by analysis tools. Which is exactly what we strived for, since the validation logic has now been eliminated! 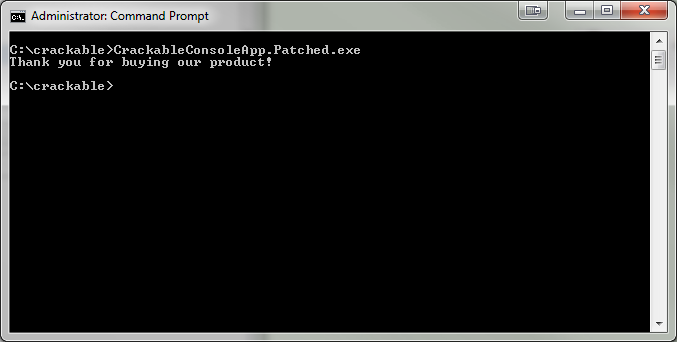 Using Reflexil, there's an even easier way of patching our code...by actually writing C# code rather than CIL! Using a modified version of our first application from the previous example, we will now patch the code by writing C# code. Notice how now, for the validation process to properly succeed, we need to set the LicenseKey property to "Enterprise" before returning true from the method. 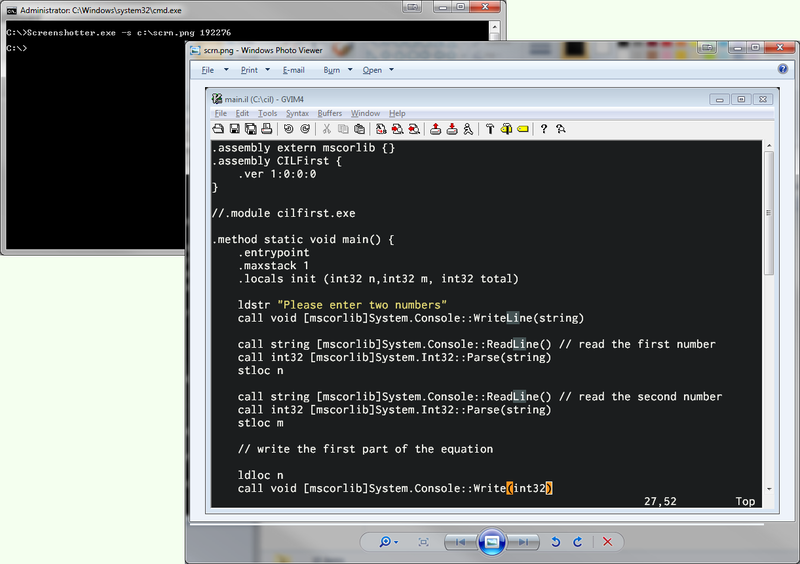 Now of course, we can do this in CIL again, but this time we'll use a much easier method. ldstr to load the "Enterprise" string onto the stack. call which invokes the set_LicenseType method (Properties in C# are just syntactic sugar for fields and their backing get/set methods) by popping the "Enterprise" string and using it as an actual argument. ldc.i4.1 to push the integer 1 on the stack. ret for popping and returning our boolean. 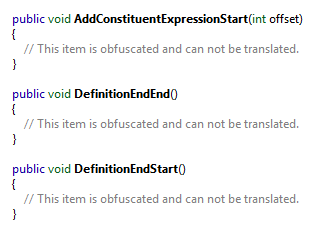 What if the assembly is obfuscated!? 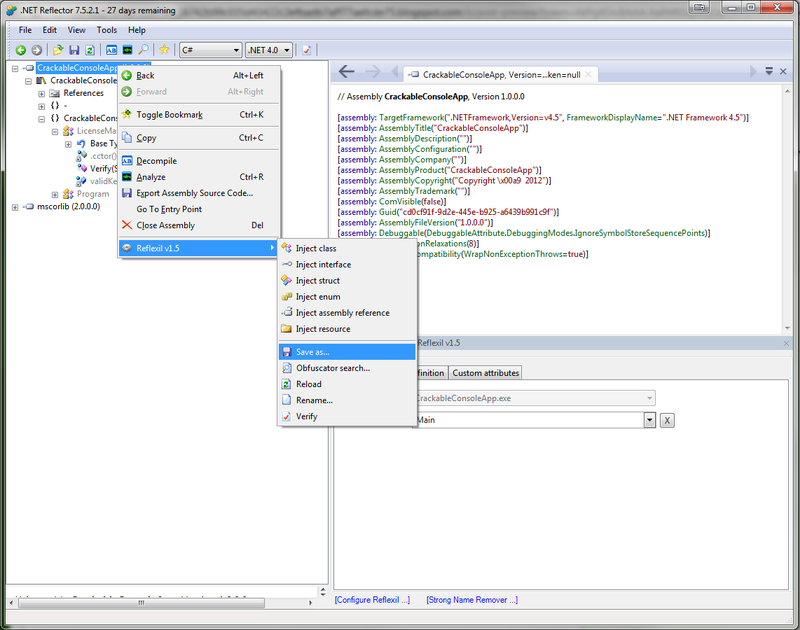 Note though that Reflexil still shows us the CIL code, so we don't have any problems when we need to work with CIL code directly...although it will be a bit harder to understand the code by looking at the CIL code only. But what we want to do for now is to find a way to view unobfuscated C# code, and that's where an application such as Gray.Wolf comes to the rescue! As you can see from the right pane, it couldn't completely deobfuscate all of our code for this example but it's at least giving us a very good hint as to what's going on without studying the CIL code. 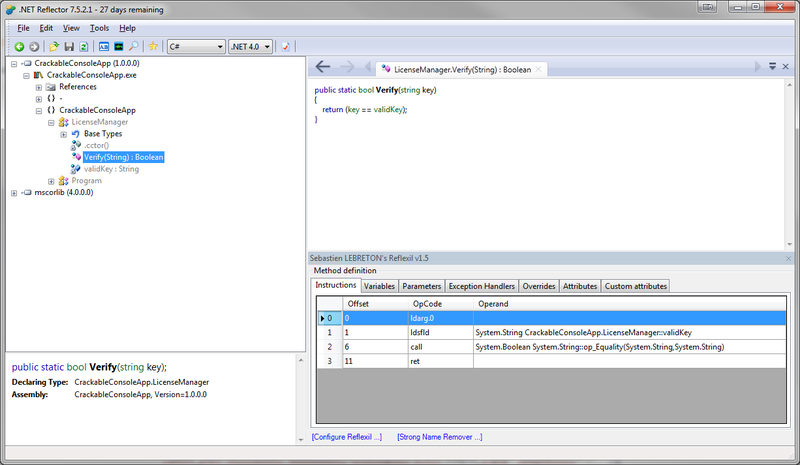 From the C# code, we can see that there is an if-statement and although Gray.Wolf couldn't deobfuscate the two operands used in the statement, we can make out what they are from the CIL code because the two values that are pushed on the stack before the op_Equality is called are done using ldarg.0 which loads the first only actual argument in the method and ldsfld which loads a value from a static field and since the only possible static that we have which makes sense to compare to is validKey, we can be pretty certain that it's using that value.